While my blogs usually start off with me walking the market and finding a new culinary treasure displayed on the shelves, this time it was actually my husband’s fortune. A new mead has arrived at Magnolia Square Market, its bottle sets it apart from the myriad of shiny, colored glass beer and wine bottles. This vessel is ceramic and painted in black matte, which catches the eye with a red, white and gold label. ‘Viking Blod’ if that name doesn’t inspire sense of intrigue you may want to check your pulse. My husband said it evoked thought of Klingon Blood Wine, which considering the name is interestingly coincidental… It is a warrior’s drink! Viking Blod a Nordic honey wine with hibiscus and hops added (they had my husband at “honey wine”). Theo saw husband’s interest was piqued and handed him a bottle, so here we are sitting in the dining room after the kids are in bed, with mismatched glassware and a chilled bottle between us. We were looking forward to sampling it all afternoon. We actually had mead (a honey wine) served at our wedding 10 years ago. They were both homebrewed by our friends and have set the bar pretty high for us when we have tried other store bought bottles. I am a big fan of sweet drinks so mead has always been a personal favorite, while my husband’s tastes lean more towards Scotch or beer. 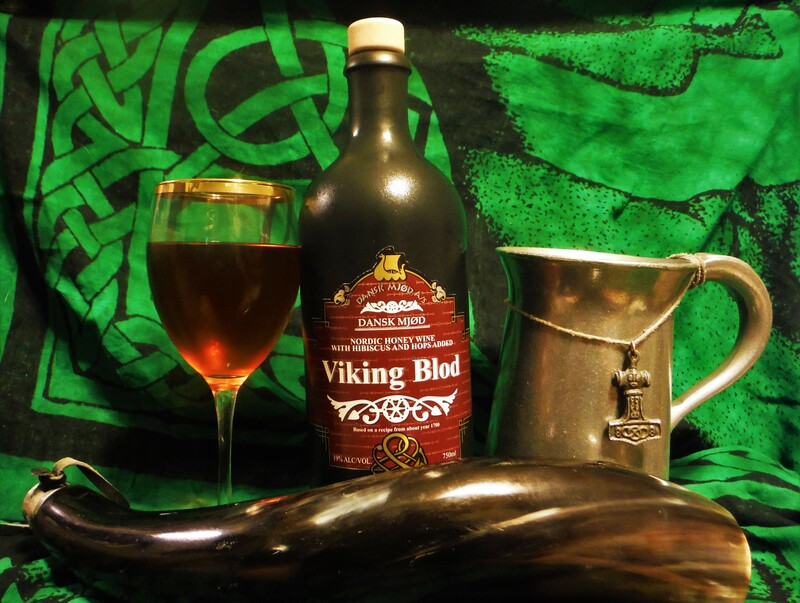 While neither of us are master brewers or sommeliers here is what we thought of Viking Blod. The smell was very pleasant with flowery sweetness and hint of spice, it is 19% ABV and you can clearly smell it. It has a beautiful rose and old gold color, and we both noticed how the tears rolled slowly down the glass. The first sip was sweet and easily recognized as a mead, and was much better than the last store bought mead we had tried. I got flowery notes with a lite spice and a very pleasant taste that lingers on the tongue. I is definitely something I might take with me to the next girl’s night to share a few glasses with. My husband found a smoky flavor, almost peat like with whisky but not as much. The hops were light and not at all overpowering and mixed with the spicy sweetness. It was something that he would want to drink out at camp surrounded by friends around a fire. All around we feel that it is a wonderful drink to sit back and enjoy. Recently we welcomed a new member to our group behind the counter; sometimes trying the products for the blog can serve as a valuable training opportunity. Looking into our deli case with all the new additions from Stiglemeier with our new guy Jason, the first item to catch our eye is the Schweinebauch, bacon stuffed with beef & pork. The outer skin of the bacon is chewy while the inside is a bit greasy with a wonderfully mild taste of pork & beef with hint of the onion used in the seasoning. The texture on the inside reminds me of a course bologna. 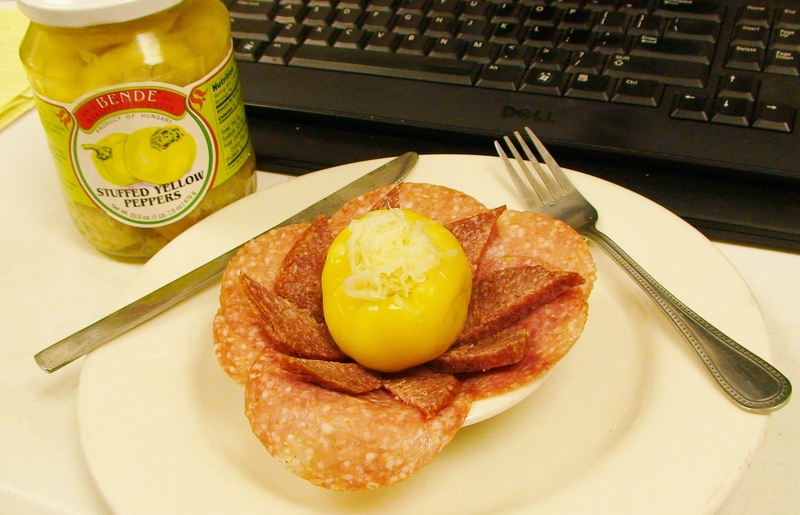 After a small sample of the Schweinebauch itself I wanted to see how it would be used on a sandwich. Not wanting to make a plain sandwich, Sydney stepped up and went about making a simple and tasty meal for us to try. Sautéing some peppers & onions, she rolled the veggies into the slice with a light drizzle of Dijon mustard, then grilling the roll for a few minutes before placing it between two slices of our Bierbrot. The combination was absolutely astounding, I knew it would be a great mix but we were all surprised just how good it was. The schweinebach picked up all the flavors of the onion & red peppers, with the Dijons flavor came across as a more sweet than spicy. 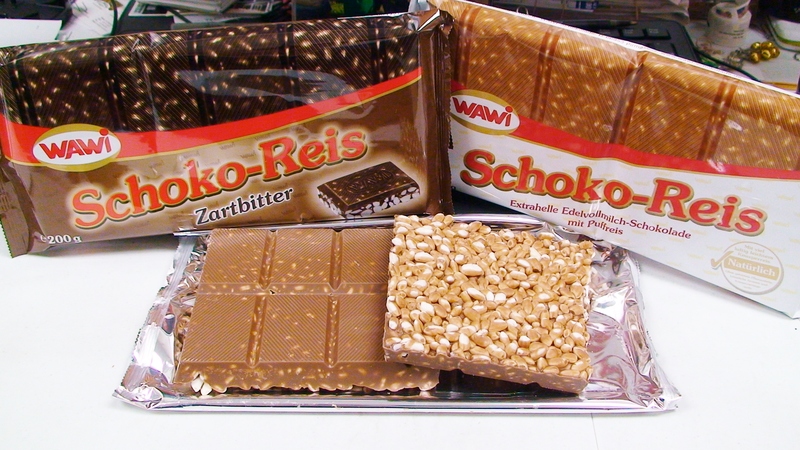 The bierbrot rounded it all out with its unique taste. For added spice we added a side of the Dijon for dipping but it wasn’t really needed. 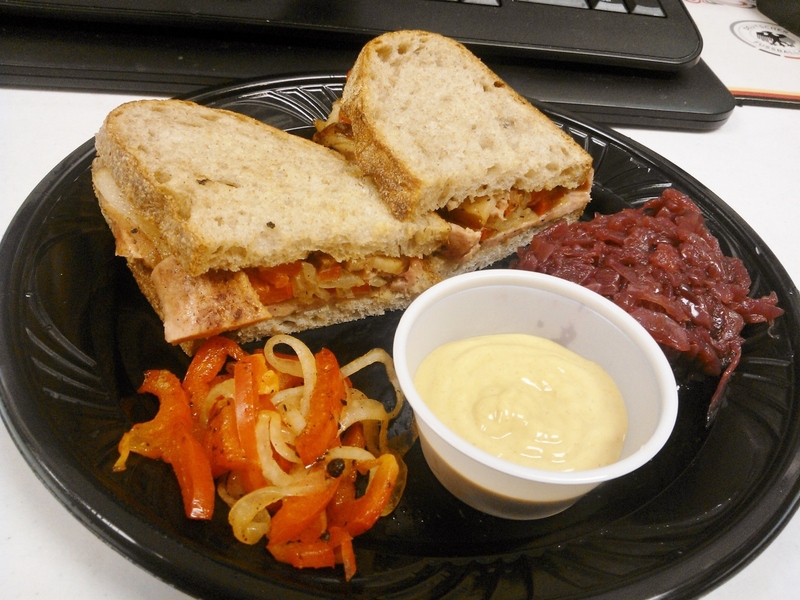 What we did enjoy was the Sweet Red Cabbage that is a familiar side from Hollerbach’s Willow Tree Café; it has a sweet and tangy profile from the Granny Smith Apples used in the recipe. It’s always exciting when we get new things in the store and last week was no exception. 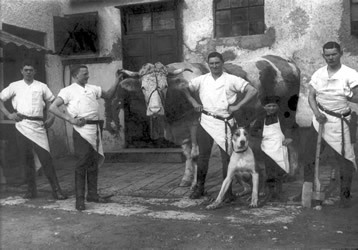 We have been working on making it possible to get in the quality products from Stiglmeier Sausage Co. for some time. At long last we are able to bring in 40 new items to add to our deli case and freezer. Some of them are more familiar and easier to recognize, others…not so much, but that is why I am here writing about all the fantastic food from Germany and other parts of Europe. 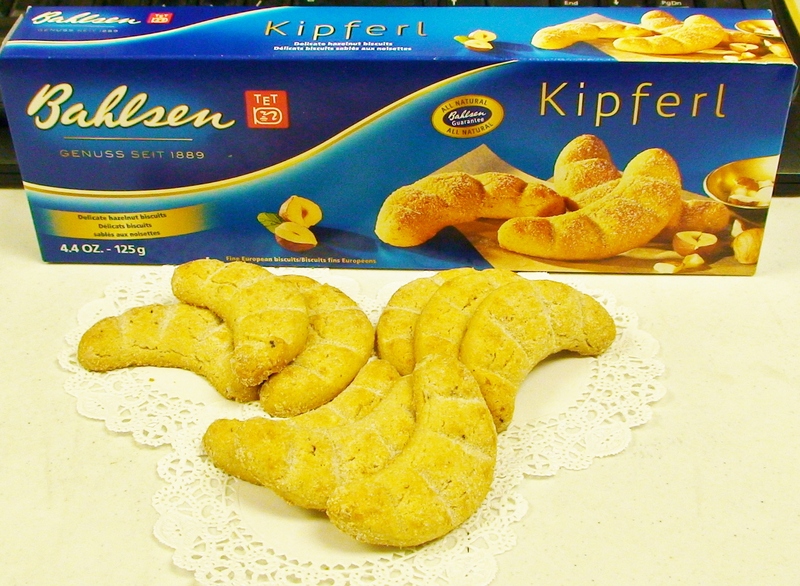 The nice thing about Stiglmeier is that like the Hollerbach’s it is a family owned operation. Anton & Gertraud Stiglmeier immigrated to Chicago where in 1960 they started the Stiglmeier Sausage Company, using traditional Bavarian and other German recipes. 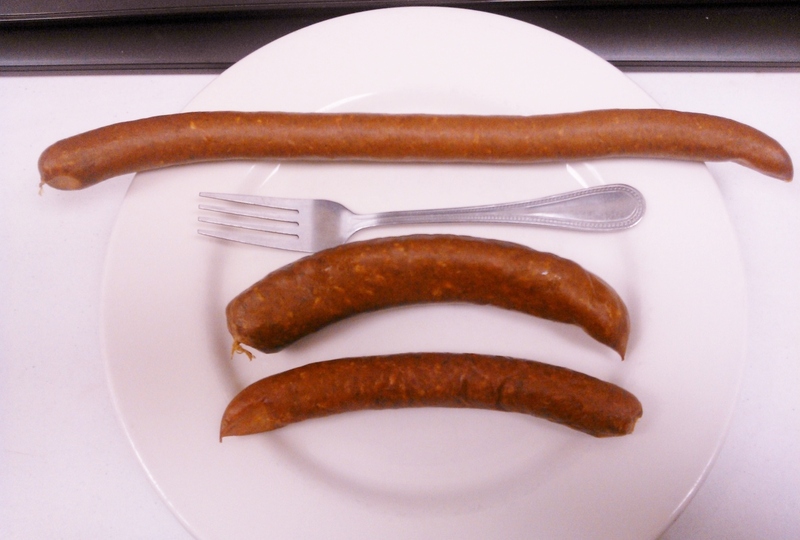 The items I’ve tried today are 3 smoked sausages that can be eaten directly from the display case. Kilometer- Smoked, Spicy Hungarian Sausage. Not overly spicy, especially at first after a moment there was a very pleasant burn, very tasty. Blows a slim jim out of the water, more moist with a nice pepper taste. 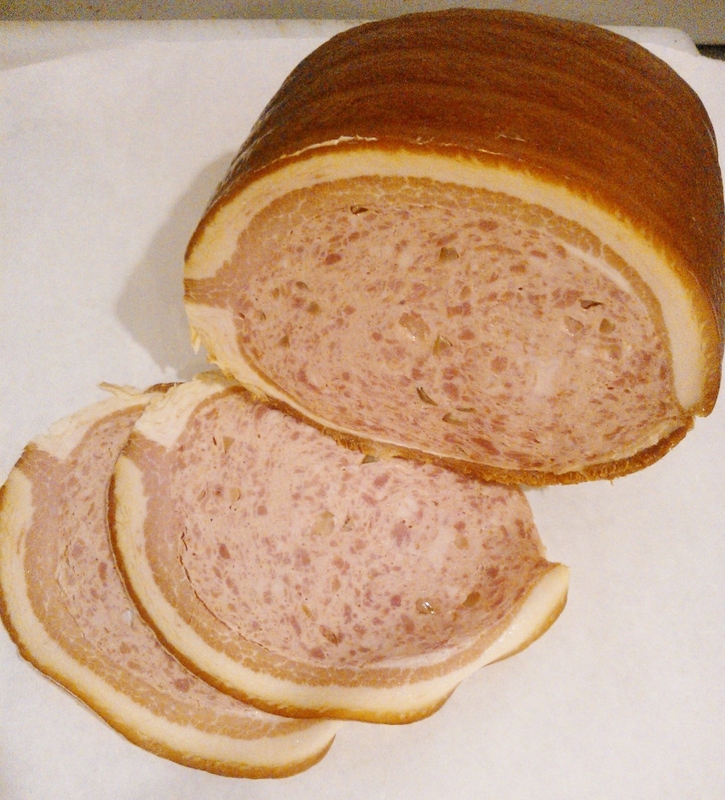 Debreziner- Mild, Smoked Pork Sausage of German origin. The least spicy but still so full of flavor. It was also slightly more fatty than the other two. Last month I went on a two week adventure, spending time in South Korea, Hawaii & Southern Utah. Over that period I tried a variety of cultural food, treats & local favorites. As a person who enjoys trying new and exciting things I was in absolute heaven! This was my very first trip off of the continent & out of the country. I’ve been dreaming for years about traveling the world and realized that I’ve been settling by experiencing the cultures through their food. Now I realize that a taste is not enough! Because I want to get back out there and get lost in another new and faraway place I just need to get back to work and start planning! Speaking of work…. Now that I’m back home and over my jetlag I started walking the floor of the market and chatting with my co-workers about food ideas to write about. Our discussion turned to a couple of guests that had been in earlier that day who had asked some questions about our specialty flavored pastas, specifically our Chocolate, and Gingerbread pasta. I had tried the Chocolate pasta before and liked it. Then again what’s NOT to like about chocolate and a scoop of ice cream? Dessert pasta is something I had never heard of, or even imagined until we opened the market and it came in with our first deliveries. Theo had to explain it to me and gave me a few examples of how it could be served because I just kept thinking Chocolate…Pasta? I took it home boiled it in milk and gave it a whirl. I enjoyed its unique taste and texture hot out of the pot with a scoop of cold vanilla ice cream it worked well. So when we got to talking about the Gingerbread pasta I was only hesitant because I couldn’t think of a way it could be served, which is where my co-worker Chris comes into play. He walks through the store & kitchen grabbing a few items and in no time he tells me that it’s ready. I walk into the kitchen and in true Chef form he has a fancily dressed plate with a mid-day dessert. 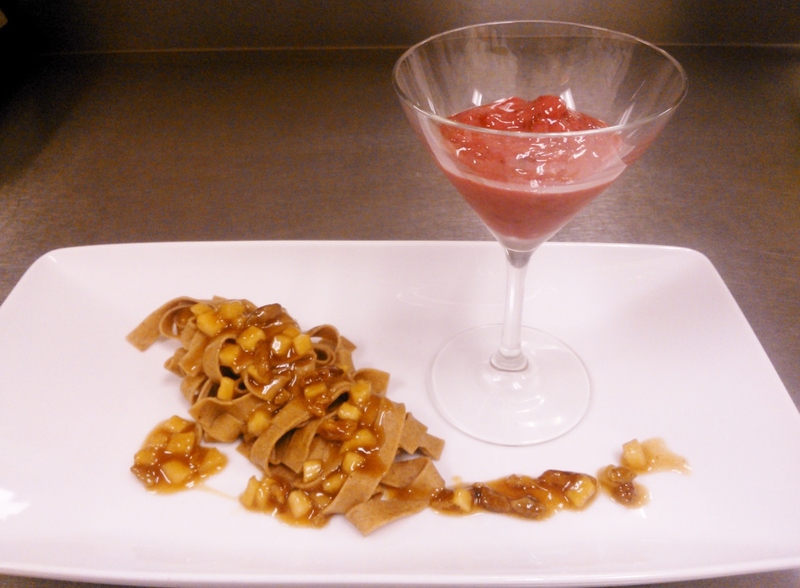 His creation: Gingerbread Pasta in Apple-Cinnamon Ragout with Lingonberry Sorbet. The gingerbread pasta was the exact texture that I had remembered from the chocolate one I had tried. It was slightly dense but not enough to make it chewy. The flavor is very mild and combined with the strong and often overpowering taste of Granny Smith Apples & Cinnamon. 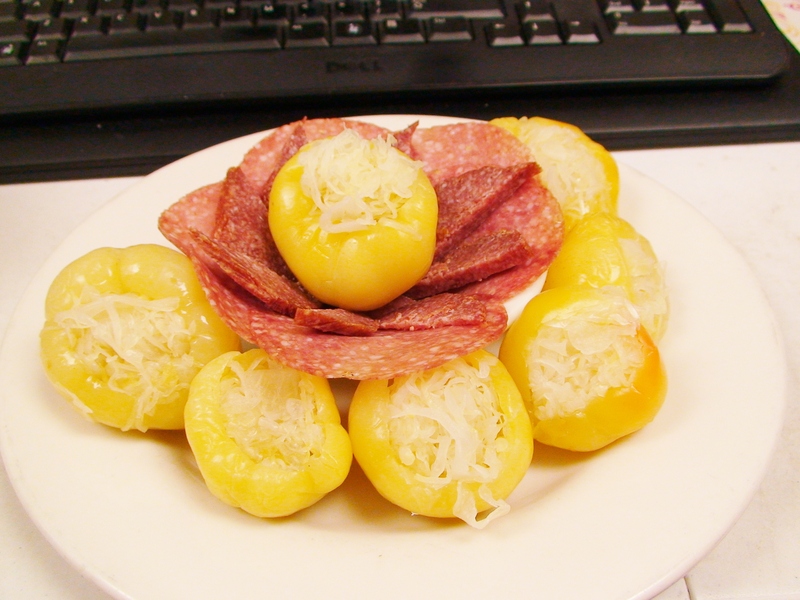 Overall the taste reminded me of the Hollerbach’s apple strudel that we make. The lingonberry sorbet he made using a jar of our Maintal Wild Lingonberry premium fruit spread, which is delicious with its whole berries. I’ve never had fresh, made from scratch sorbet before. It was overly sweet but still wonderful with the frozen texture and berries, I let it soften a little and it became like a sugary fruit smoothie. On the bright side of having so many sweets mid-day I have been able to power through writing this blog in record time, whew Sugar RUSH!!! Anyone out there have a recommendation for my next adventure? Brown the sugar in a sauce pan and then add juice. Let the sugar dissolve and add the apples & cinnamon. Let simmer for 3 mins and mix starch with a little bit of water. Add starch mixture slowly to the apple till perfect consistency (it has to be creamy, not to thick). Set aside and let it cool down. 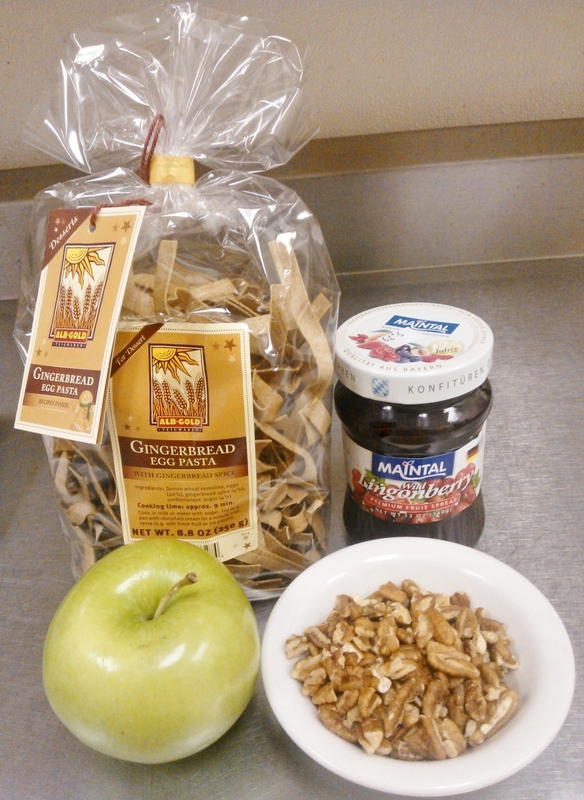 Boil water (or milk if you prefer) add the gingerbread pasta and 6oz of sugar. Cook for 9 mins, strain and keep pasta warm. Mix all ingredients together and freeze.